The justification of the new law was that the 2016 September Constitutional changes re-defined the notion of the “Armed Forces.” According to the amended Article 9 of the Constitution, the Armed Forces consists of the Army and other Armed Units. The original law on the Status of Armed Forces, adopted on 9 October 1991 and amended in 1992 and then more substantially in November 1993, defined the Armed Forces of Azerbaijan as consisting of land forces, air defense, and military air and naval forces. The 2016 amendments also expand the responsibilities of the Commander in Chief, namely the President. His authority now extends to other militarized units such as internal Troops, border guards, and civil defense units (under the direction of the Interior Ministry the State Border Service, and Ministry of Emergency Situations, respectively) in addition to the Special State Protection Service, already under the full control and authority of the President. Another Constitutional amendment related to the Armed Forces is that employees of other Armed Units are no longer prohibited from going on strike. However, the new law was needed not only in response to the Constitutional amendments, but also to provide clearer definitions of the tasks of the Armed Forces. Broadening Tasks or Simply Clarifying Definitions? 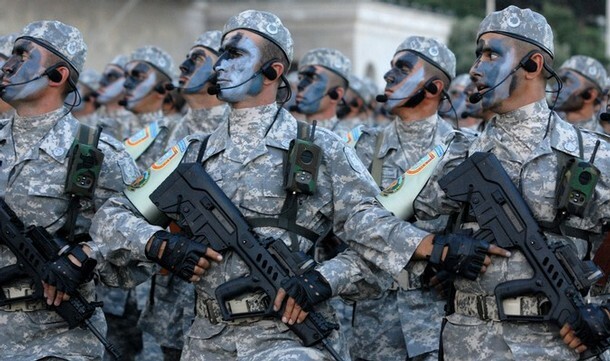 The new law defines the Armed Forces as the Azerbaijani Army and “Other Armed Units.” Article 1 describes the latter as “state bodies or bodies included in the structure of the Armed Forces who perform special duties defined by this law and are subject to military service.” These other armed units were established and performed under various Ministries, such as the Interior Ministry and the Ministry of Emergency Situations. The Armed Forces are created by the state for the defense of the Republic of Azerbaijan, the elimination of foreign aggression, the realization of the objectives set out in the Military Doctrine of the Republic of Azerbaijan, as well as the ensuring the security and national interests of the Republic of Azerbaijan, the protection of statehood, sovereignty, public order and public safety, protection of state borders, the organization of civil defense, mobilization and conscription, the organization of the safety and security of the state protection facilities, and the accompanying and guarding of prisoners and detainees. to combat international terrorism and organized crime. The difference is that under the amendments, the Azerbaijani Army’s units are legally empowered to perform these duties that previously were the responsibility of other units. There is now no distinction made between the duties of the Azerbaijani Army and other Armed Units. The other Armed Units can participate in military operations and support Azerbaijani Army units. But there is a clearer distinction made in regard to military service. Previous legislation (2011) rendered the definition of military service as broad as possible, from engaging in combat operations to helping the public authorities in the protection of the rule of law. Notably, the new law has introduced a ban on the establishment and operation of political parties, non-governmental organizations, and religious bodies in the Armed Forces. In fact, some of these limitations are already in force and regulated by other laws. Moreover, there is no ban on army personnel being members of political parties, as stated by MP Azay Guliyev. The old law also stipulated that “activities of politically-affiliated organizations and trade unions in the Armed Forces of the Republic of Azerbaijan are prohibited.” However, particular attention should be given to the religious bodies activities ban, which is broadly formulated with wide-ranging applicability. This broad prohibition is aimed at combating the spread of religious activity among armed personnel and eliminating proselytism. This issue came to attention in Azerbaijan following the coup d’état in Turkey; some members of the Turkish military were affiliated with the Gulenist movement. During discussions of the draft law, there was much debate regarding democratic controls over the Armed Forces. The new law gives this task to the Commander-in-Chief. Some MPs have requested additional mechanisms to ensure Parliamentary oversight, such as Gudrat Hasanquliyev, who stated that “the relevant committees of the Parliament should have the right to invite relevant officials to hear violations of these or other laws and concerns in Armed Forces.” This suggestion was supported by a minority of MPs. Even before the new law, Parliamentary oversight over the Armed Forces was limited, and with the new provision, any prospects of public oversight and democratic accountability have been lost. Moreover, journalists used to have the opportunity to criticize or request explanations from the Ministry of Defense on issues of hazing and scandals related to non-combatant deaths, especially since 2008. This has also served to limited public/media oversight. The new provision on ensuring information security, and any potential amendments to the criminal code that may follow, journalists and other public figures will be afraid to engage in such requests. Zaur Shiriyev is an Academy Associate at the Royal Institute of International Affairs (Chatham House, London) and an EDSN Fellow. EDSN is an international project of the Center for Social Sciences, Tbilisi, and made possible with generous funding from the National Endowment for Democracy.